Some of the most famous long distances swimmers have often maintained that 50% of the actual ability to complete the extreme swimming goals we set for ourselves are mental. That's really interesting but why is it that most of us don't work on it? Recently, I caught up with a Swimmer in Dover who is a legend in long distance swimming circles and one of very few people to have swum the North Channel (among many other things). He noted that when he was in the run up to the actual swim he would take the dog for a walk on his own around the bay in Dover and try to get his head around the swim and think about how much he 'wanted it'. He spent countless hours alone walking a dog who obligingly didn't answer back but arguably the key part of the swim was probably swum in his head before even getting his trunks wet! I can empathise with him. When I was training to swim Loch Lomond I had many quiet times digging into why I wanted to swim this so badly and what mental strength I could draw on to get the job done. I spent hours in our local village church just sitting in the rear pews when no-one was around. I drove home from the swimming pool pretty emotional so many times recalling how much I wanted to make an impact and raise funds for the Rainbow Trust so that terminally ill children and their families would receive support from carers. Something had to be done and I didn't want to leave it to the next person to raise money. When I stood on the beach at Ardlui with 23-odd miles of swimming ahead of me, all the effort I put into the mental side paid off - I'm really sure of that. Indeed, if you watch the Martin Strel film about conquering the Amazon, he would spend hours in quiet contemplation about how he saw all what nature could throw at him as friendly - he seemed to befriend all the terrifying fish, alligators, eels etc that could have been a show stopper. He would spend hour after hour in a quiet room or cave (if I recall correctly) in a meditative state which was going to no doubt assist in conquering the goal he had set himself. We are all different. We are probably motivated by different things. Some by grief or loss, some by anger, some by empathy, some by pure escape, some by messing with danger....you name it. I've seen some really great swimmers completely melt under the strain. To stress the point, last Sunday 26/05/13, in 10 degree water, I came to the aid of a relay swimmer. A guy probably in his 30s training in Dover Harbour who was one minute swimming along in cold water with an orange cap on and then the next minute in a complete panic shouting his head off that he was 'losing his mind' and he couldn't go on. I managed to get him to realise that he could swim the 800m or so back to swimmers beach with me and back to safety. 'Charlie' (the swimmer in question when he could finally tell me his name) will have learnt a great deal from realising he actually COULD overcome his anxiety and look after himself. The coastguard had been called out but I'm glad this lad may have learnt a life lesson. By the time the coast guard would have got to him the situation would probably have become pretty serious. One turning point for me in overcoming the cold water (in 2011) was to try and learn from experiences that other human beings had from taking on either swimming challenges or other endurance events. 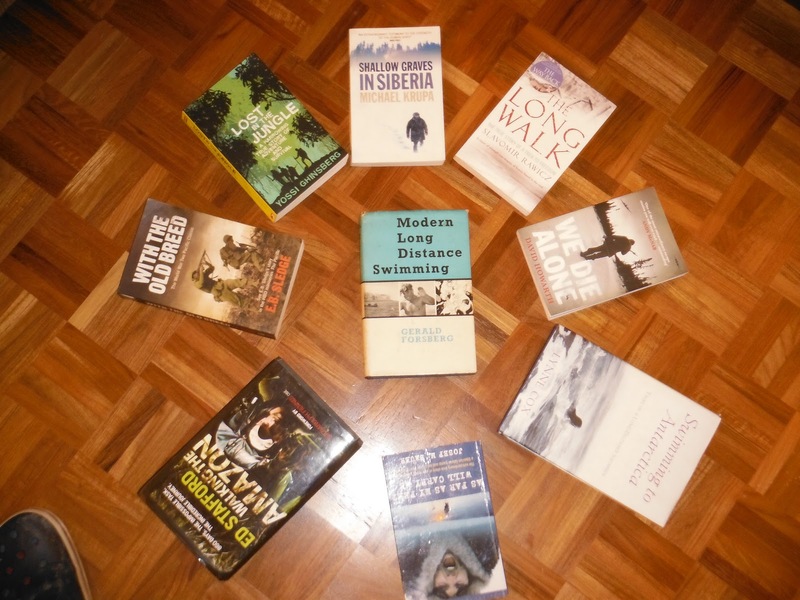 I went on to read all the 'Escape from Gulag', 'World War 2' and 'Endurance' genres which sit proudly on my study shelves but the ultimate thing I learned is that we are all capable of greatness when you just realise what other mere mortals have had to get through in history.